a swingy triangular lace insert. The easy lace pattern is also worked along the front bands and extended around the neck for the collar. Ribbed buttonbands are worked at the same time as the body. Shown in size 36.25” / 88cm with 2” / 5cm negative ease. Part of the Davenport Collection! 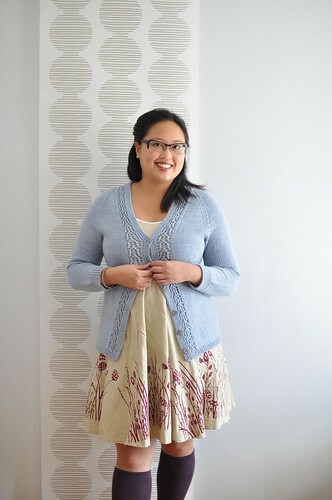 Purchase 3 or more patterns from the Davenport Collection on Ravelry to receive 25% off. Finished Bust: 33.25 (34.75, 36.25, 37.75, 39, 42, 45, 47.75, 50.75, 53.75, 56.5)"
Shown in Lorna's Laces Sportmate in "Fjord"
6 page PDF pattern includes charted and written lace pattern, schematic and abbreviations. Measurements in imperial and metric.